I became a counselor for the Space Exploration merit badge about two weeks ago. 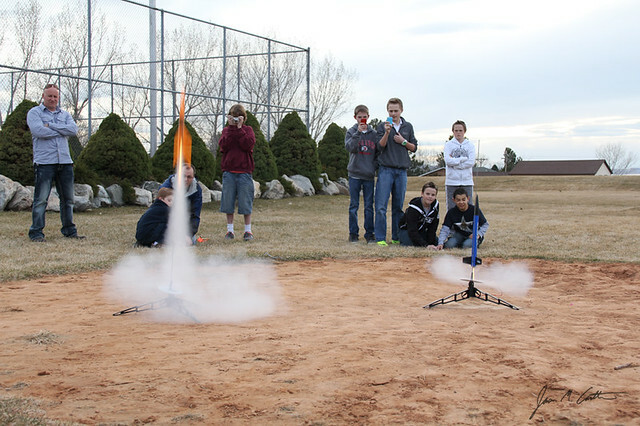 Last week, we talked about Newton’s Laws and made these Estes Model Rockets. Tonight, we launched them at a local park. The weather couldn’t have been better – no wind. no rain. no problem. I grabbed a few shots of the rockets launching. I missed the rockets about half the time, either getting it motionless on the pad, or out of the frame. But here is one I caught just after ignition. You can check out some of the other outtakes on my Facebook page, as well as a photo of the rocket that didn’t deploy and slammed into the ground with such force, its nose cone required some digging to recover. Scary part was, my son was standing 10 feet from the impact zone when it happened. Great pictures! 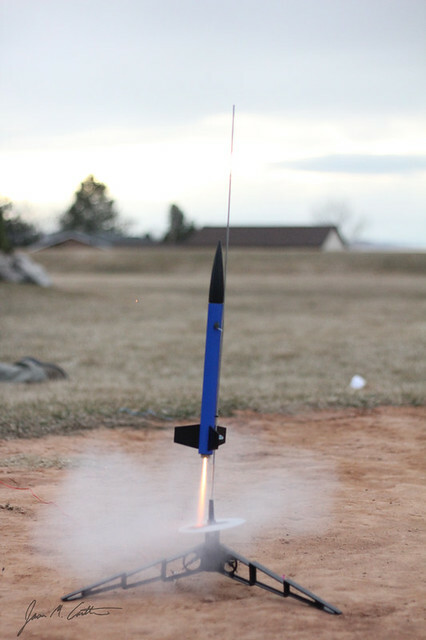 This really brings back some memories – both of building and flying rockets, but also trying to get pictures of them. I was building Estes Model Rockets in 1968 – almost fifty years ago. I’m afraid the camera I was using then wasn’t quite as nice as your Canon. I’m going to have to dig around and see if I can find some of those old shots. Thanks. I remember trying to take a photo of them with film cameras when I was younger, too, but you couldn’t ever tell if you were doing it right until you’d wasted a whole roll of film. Love going digital.